Description: Phineas T. Barnum are the great showman of the age. 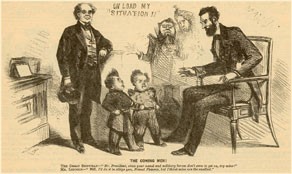 After he promoted the marriage of General Tom Thumb and Livinia Warren, a reception was held for them at the White House. Barnum, the Great Showman. Says to President Lincoln: “Mr. President, since your naval and military heroes don’tseem to get on, try mine!” Mr. Lincoln responds: “Well, I’ll do it to oblige you, Friend Phineas, but I think mine are the smallest.” Secretary of Ward Edwin M. Stanton and Secretary of Navy Gideon Welles are shown looking on from the background.